We know how important global and societal issues are to our students. At Tangent, Trinity’s Ideas Workspace, we are committed to empowering Trinity students to make a real impact on society and the world. 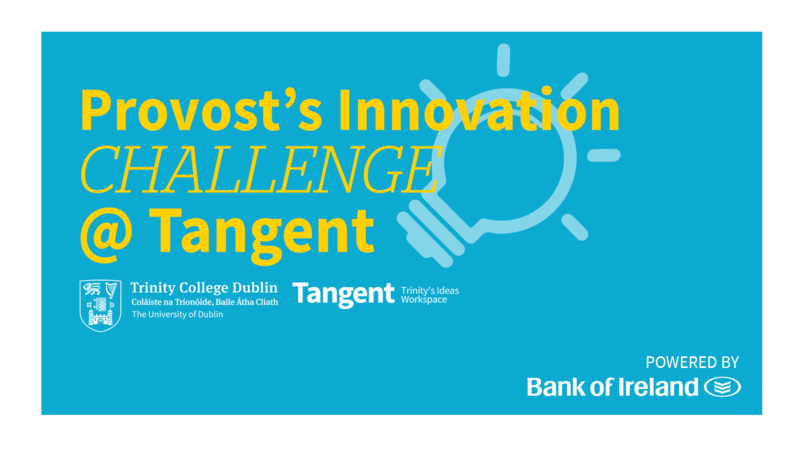 This year, for the first time, we ran the Provost’s Innovation Challenge @ Tangent, a social innovation programme that provides supports, creative outlets, mentorship, and the chance to have a real impact on a global problem. In 2019, you chose Homelessness as the problem to address with this year’s Challenge! Thank you to everyone who voted in the Challenge, and who took part in Hacking Homelessness, March 22 – 24. The Provost’s Innovation Challenge @ Tangent supports our students to engage with pressing issues facing the world and to explore turning their ideas into impactful, real-world ventures. It’s also a competition — and an opportunity to win €10K funding to develop your solution over the summer. The 2019 winner of the Provost’s Innovation Challenge @ Tangent were The Homeless Wallet and The EcoSystem. Homeless Wallet enables cashless and transparent donation via a blockchain digital wallet, while The EcoSystem’s mission is to create sustainable communities for the homeless with a smart approach to space and accommodation, similar to the Japanese pod hotel model. We will be rolling out our vote for the 2020 Provost’s Innovation Challenge @ Tangent during Michaelmas Term next year. Our hackathon for the Challenge will take place during Reading Week in March 2020. 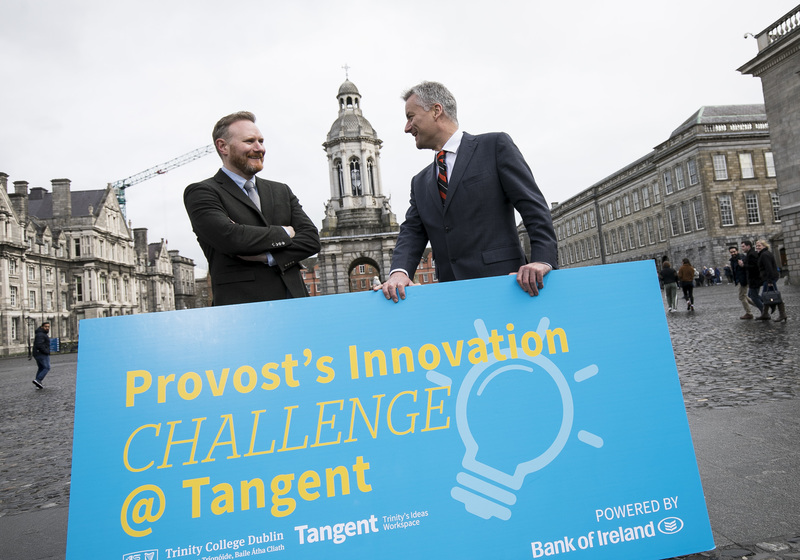 What does the Provost’s Innovation Challenge @ Tangent entail? You’ll think creatively and critically about a global problem. You’ll brainstorm ideas, along with other passionate individuals, that could positively impact on the problem. The Provost’s Innovation Challenge @ Tangent 2019 was a hackathon around Homelessness as chosen by the College community. Who is eligible to get involved? The whole College community can vote on the problem – staff, students, alumni, everyone -, but we are asking teams of Trinity students (UG and PG) to work on the solutions. We will be open for registrations for our 2020 Challenge in Michaelmas term of AY1920 so stay tuned! I don’t have any ideas for solutions – is that a problem? You have more ideas than you’d think, but don’t worry – you don’t need to know what your solution will be right now. We’ll work with you on that as the Challenge progresses. I am part of a team already – can we work together? The best way to ensure you can work together throughout the Provost’s Innovation Challenge is to attend the events, but you should also be open to working with other people during the Challenge – often the most successful teams have a mixture of disciplines and ways of thinking represented. What’s the problem we’ll be working to solve? Voting for the 2020 Provost’s Challenge @ Tangent will open in Michaelmas Term AY1920. In 2019, Homelessness won the vote with 34% of votes cast. Am I expected to solve the whole problem? The example we always use is this: Say the problem everyone votes for is Healthcare Inefficiencies. Solutions posed could range from a better appointment booking system for hospital appointments, to an app that allows doctors to check on their patients without requiring a visit or an appointment. So the problem is big, but the solution(s) can be small (but mighty). I’m a Trinity alum and/or member of staff and I want to get involved. Great! You can vote to help us choose the 2020 Provost’s Innovation Challenge @ Tangent when voting opens, and you can help mentor and guide a team by getting in touch with Alison to volunteer closer to the time. What dates do I need to be free for to take part? The 2020 Provost’s Innovation Challenge @ Tangent hackathon will take place during Reading Week in March 2020. Other dates for your diary you will be able to find on the Tangent Events page.